Fiona Barton returns with her new book after her bestseller „The Widow“. “The Child” is a very complex and elaborated. I was not a huge fan of her first book, I thought it was OK. But she has a talent for creating unique stories with interesting characters. So when I read the blurb of this book, I thought I give it another try. “The Child” tells a complex story. The skeleton of a baby is found on a construction site. Three women are affected by that. One of them is journalist Kate Waters, who we know already from “The Widow”. She takes an interest in this story and is determined to find out who this baby was. Slowly she untangles a dark and sad story. I must admit I am still not a huge fan although I enjoyed reading this book. I can’t put my finger on it what it is but something is missing for me. Barton’s writing style is beautiful but maybe a bit aloof. The story is also a slow-burner and goes into every detail. It is a character driven story and the main point is how Kate finds her way through this mystery. Unfortunately I had an idea how everything could be quite early in the book but I discarded it while going on further. But I was right; I figured the end-twist. Usually I am not so clever and I hardly think much about figuring out the end or the killer etc. while reading. So at the end the surprise for me was that my idea was right. Despite my little nagging about the book I enjoyed reading it. It is an unusual story, the writing is good. It is unique. I like that. 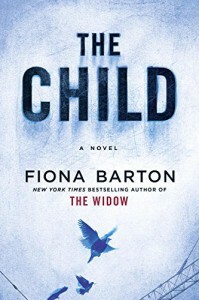 I enjoyed “The Child” more than “The Widow” and I am looking forward to her next book.